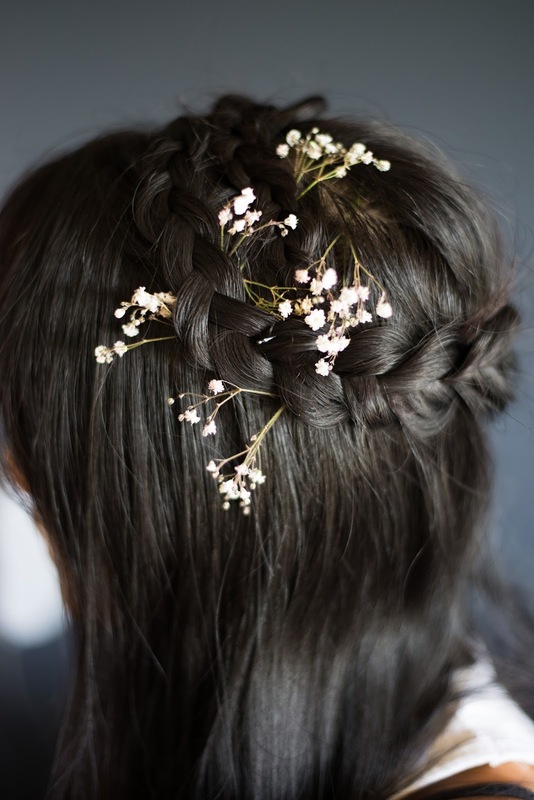 Whether for a wedding occasion or not, wrapping a dutch braid around the crown of your head, while leaving the remainder of your hair to fall naturally, has got to be the quickest, most simple, yet perfectly romantic way to dress up your hair. 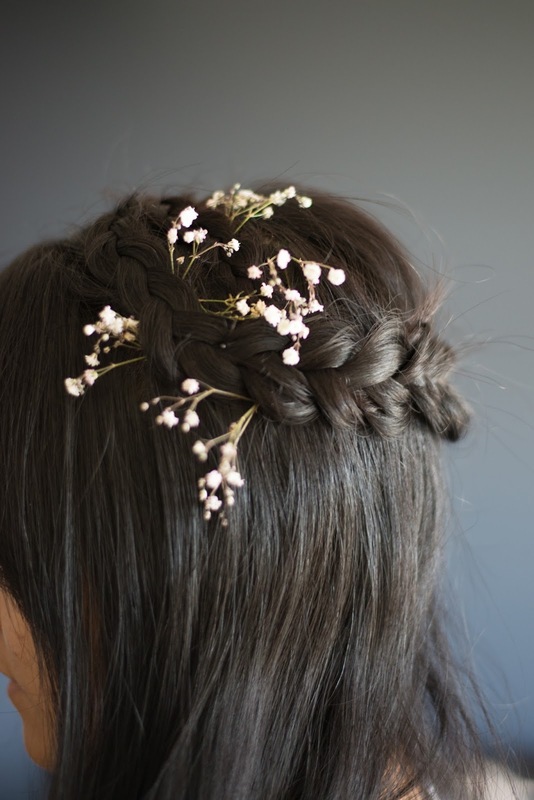 Coupled with a few sprigs of Baby's breath to add a whimsical feel or glam it up more by curling the ends. The key to a less severe braid up do is to leave out your fringe or the strands of hair that frame your face; measure a line from your left ear, up and over to the right ear (like a head band) and clip the hair in front of this line away. 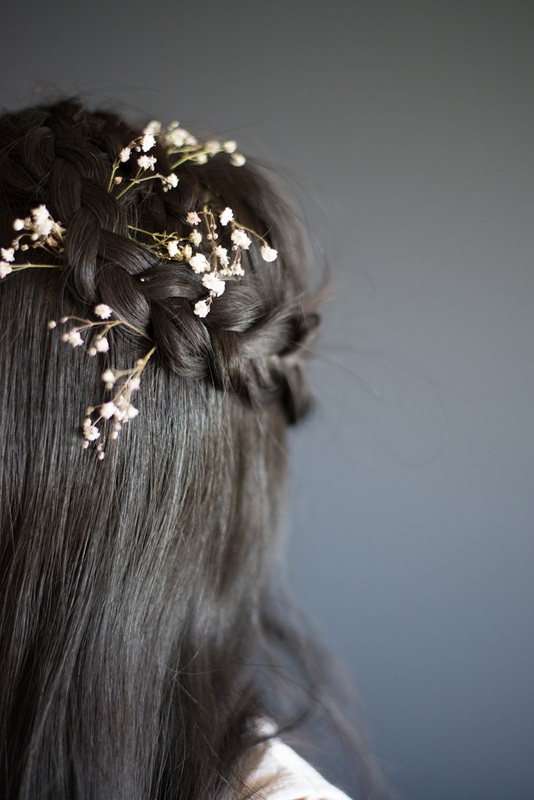 Also clip away the remainder of your hair where it doesn't belong to the top crown of your head, as you would need to leave a good amount of hair to fall naturally under your dutch plait crown. Start dutch braiding with three very small sections of hair from the top of your head where your hair parts naturally, or where you have created a part (I like to create a deeper side part), and then pull in 1/3-1/2 inch sections, dutch plaiting relatively tight and in a circular motion around the crown of your head (I like to dutch plait anti-clockwise, you can choose whichever way feels natural to you). Once you have finished braiding all the hair, tie it off with a small elastic band and start pulling the plait apart gently to create a fuller looking braid. Fold your hair around the crown of your hair in a circle (you may find that you will overlap your plait if you have rather long hair) and tuck in the elastic end underneath your crown. Bobby pin the end securely to your crown plait and also bobby pin down anywhere the plait is not sitting snug with your head. If you find that your plait is looking too "neat", and you need to pull the plaits out more, but your dutch plait crown is already secured to your head, you can still do so, but it's probably best to do this gently with the end of a tail comb. 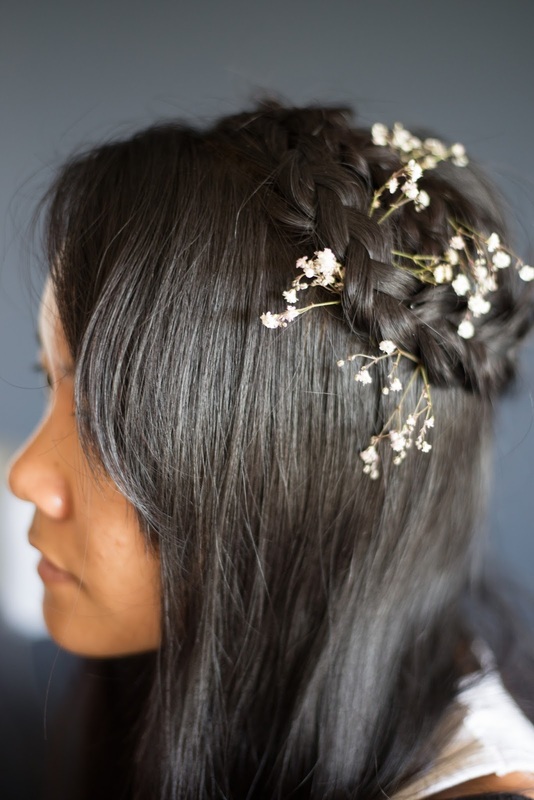 If you can't dutch plait, well then aside from YouTubing how to do it, you can easily just plait a normal braid following the crown of your head and secure this with bobby pins.